SIP (Session Initiation Protocol) trunking refers to a VoIP service that allows a business to connect their current PBX system to a cloud-based phone system using an ITSP (internet telephony service provider) such as us. Unlike traditional phone systems, all calls will be transferred over the internet as data. A SIP trunk is measured by the number of calls that are allowed to flow across the connection. This measurement is called ‘CHANNELS’. In order for your business to make two calls from the building, you would need a SIP Trunk with two channels likewise, if three calls need to be made then three channels would be required. Channels can be used for either inbound calls or outbound calls. If a company has three calls in progress, and one is outbound, and two are inbound, they will need a SIP Trunk with a channel level of three. It’s simple, for a SIP trunk to work, your business needs an adequate internet connection (this is to ensure communication within your business is at utmost efficiency), phones and a pre-existing IP-PBX system. When calls are made in your business, their translated to data packets are then sent over your data network. The number of SIP trunks your business has will be solely determined by your company’s needs. One of the many benefits of SIP trunks is that businesses typically save over 40% in costs when they adopt SIP trunks into their phone system. Saving is mainly due to the fact that SIP trunks can work with pre-existing IP-PBX systems, meaning that you may only need to purchase the odd equipment here and there. Unlike traditional phone systems, SIP trunks can be delivered and deployed quickly. SIP trunks can be created and deployed on the same day, a stark contrast to traditional phone systems which can very well take a week to months to function properly. The ability to be flexible is of utmost importance in a business and with SIP trunks, you’ll get just that. If your business has increased the number of its employees or is experiencing a surge in calls, then you can instantly add channels to your system with the click of a button. 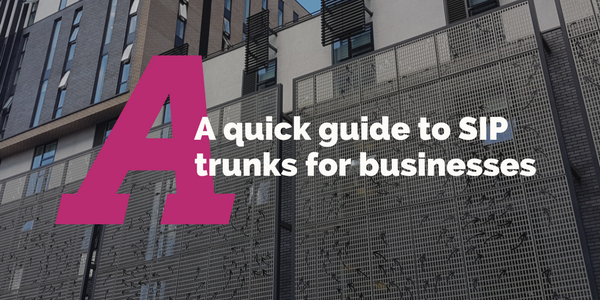 No one likes being tied down, whether it’s to one location or one number, fortunately for you, SIP trunks allow your business to be as flexible as you want. With SIP trunks, your business does not have to be restricted to your current local exchange area. Even if you move location, your business can keep the same number! You can safely say goodbye to the daunting task of having to forward calls. Interested? Click here to make an enquiry about our SIP trunks.